Those days were down and dusted when people use to search for “Fresh Methods of Making Money Online” because, at the present time it is tremendously easier to earn through different freelancing websites. There are numberless Freelancing websites, which provides heaps of opportunities to Freelancers i.e. Elance, Freelancer, Odesk and etc. However, The Ideal Freelancing website for part-timers is Fiverr it has a unique concept which makes it the finest freelancing website. Fiverr gives a chance to every single person to earning quick bucks, but the biggest problem with them is that a person could only earn $5 (excluding the commissions) per gig. For some highly-skilled person, it is not enough. Fortunately, there are many Fiverr alternatives that provide flexibility to its users. People can select their own Rates without any hesitation whatsoever. 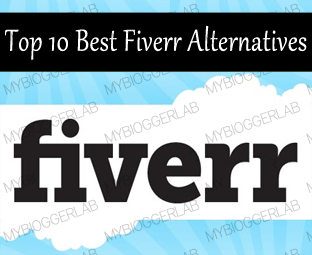 Today in this article, we will be sharing a list of Best Fiverr alternatives. Before, we jump onto our alternatives its essential that a person should learn that Why he should not go with Fiverr (The Pros and Cons). Following are the few legitimate reasons why a person should not choose Fiverr. $5 Is Not Enough: Does any developer would create a whole new Template for just $5 Dollar? I Guess, a Big NO. The biggest flaw in Fiverr is that, a person cannot increase the amount and which is FIX to 5 Dollars per gig. Though, it allows adding additional services through which people can expand their earnings, but the main gig would remain to be $5. 20% Commission Goes in the Pocket Of Fiverr: Secondly, they take a hell lot of commissions. Just think of it a normal freelancer would only get 4$ dollar per gig while the remaining 1$ goes to Fiverr. For Example, a person earned 2000 Dollars by spending days and nights in completing the Gigs, but in the end he only got 1600 dollars while the remains 400 dollars goes into the pocket of Fiverr. Still, we believe Fiverr is an ideal place for those who want to make quick bucks. However, who want to continue their services for long terms could try their alternatives. Following are the few that we think would work awesomely. SEOClerks is a heaven for web developers and SEO Consultant. Using their flexible interface anyone can easily sign up without paying a single piece of penny. The range of gigs starts from $1 and could be as high as $1000 (That’s what we call a decent payment). In short, it is an ideal Microjob web portal that provides benefits to both buyer and seller. People can Sell Facebook Likes, Backlinks, Twitter Followers and anything that relates Search engine optimization. Gigbucks is another famous online Microjob website. Unlike SEOClerks, people can post gigs beyond Search engine optimization and web developing. On Gigbucks people can gig about anything which includes technology, bizarre stuff and etc. A seller gets paid through their Payza/PayPal Account or they can even use their Credits to withdraw their earnings. 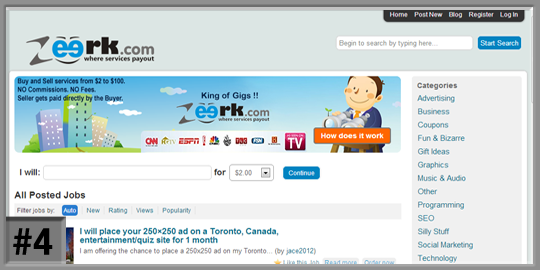 It is a free to use platform which pays $5 to $50 per gig. Amazing huh? Indeed it is. Fourerr is the perfect alternative to Fiverr because it offers almost the same services, but only difference is that they max Bid per gig is $4. It also takes a 20% commission, and a user can cash out his payment through PayPal or Payza. It is not as remarkable as Fiverr, but why don’t give it a shout because there is nothing to lose. Zeerk is the only Commission free platform that didn’t cut a single piece of penny from the gigs. Anyone can register to create a gig starting from $2 and could go beyond $50. Just like other platforms, users can cash out their earning via PayPal or Payza. Nice and modest interface with highly professional support staff waiting to assist. 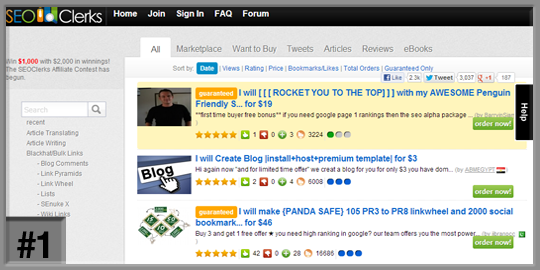 TenBux appears to be the exact clone of Fiverr in fact it is using the same scripts, and even the categories are same. The only main different we could found is that, they offer both $5 and $10 per gig. It’s free to register and pays via PayPal and Payza. 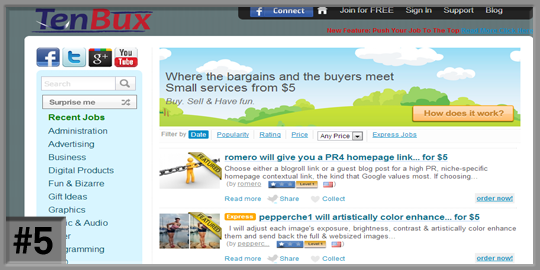 Following are the list of those websites which are similar to Fiverr, but they are not that much popular. However, they are growing day by day. This article won’t be finished if we will not list them below. Consider the following Upcoming gigs websites. FiveSquids: It is one of the bestselling Microjob website in UK. People can bit up to $25 dollars while the rest procedure is same as others. However, it takes 15 days to precede the payment. Goferr: The Maximum gig bid is $25 which is quite marvelous. However, it doesn’t have that much buyer, so it needs around a few more years to get active. Check it after one year if it remains online. Dollar3: It is another incredible Microjob website which is best known for its multiple gig bids. A person can offer $5, $3, $6, $9, $12, $15, $27, $45 and $90 gig bids. TwentyVille: It’s a place where everything is for just 20 dollars. It’s not a popular website, but it is growing on a daily basis. 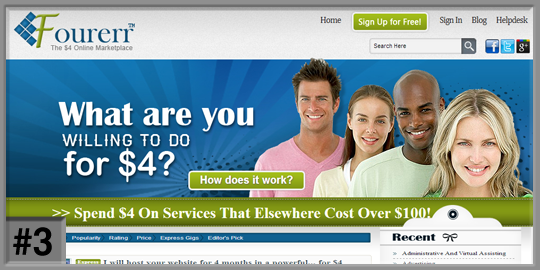 Justafive: They offer Job Board for $5 or $10 or $20 Jobs which is quite remarkable for those who are fed-up of Fiverr. It’s not so popular, but worth considering. We hope you guys have enjoyed the feast. To be honest, we are also trying our luck on such website and so far it has given remarkable results, which were not expected. In coming up days, we will be sharing more tips and tricks regarding Fiverr from beginning to the ending. What are your thoughts about Microjob website? If we have left any website then do leave it in your comments. Take a lot care of yourself till them, Peace, Blessings and Happy Gigging. Absolutely great list. I am a level 2 seller on fiverr and i agree on what you state about their commissions. I will try some of the alternatives you mentioned on the post. great post.. thanks for detailed info. here is another one i found.. Here i want to share a honest review of a best fiverr alternative which i usually use or iam earning money from it. Well it is "SEOCLEKRS". Seoclerks is an awesome website which is beneficial to both seller and buyer. Seller can choose service from a variety of gigs and can order which can be afforded. And in the same way buyer can earn huge money by providing their seo services. Now to be honest till i've earned $200+ in few months by providing my small freelance services ... So guys you must give a try on Seoclerks. SEOclerks.com is really amazing, I'm a member of this community for more than a year now and I have no complains, bought more than $400 worth Gigs, all were so good. Support is active and fast. I think that Mercadillo5 (google it) should be in this list..! Through this site, people are making much more money than in other fiverr alternative site. Why? So, because of its potent affiliate program! It is really amazing to make money through you gigs and passively through your affiliates.